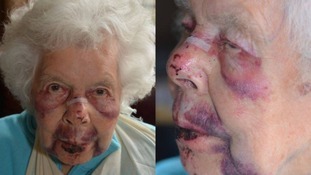 These are the dreadful injuries an elderly woman suffered after being robbed in broad daylight in Weston-super-Mare. The 88-year-old woman, who has not been named, was walking with her husband in Colonel Stephens Way on January 10 when her attacker struck, around 1.50pm. Her attacker snatched her handbag from her arm, which caused her to fall to the ground. The woman suffered a broken nose, fractured wrist and severe bruising as a result of the attack. After stealing the handbag, the offender ran off down an alleyway leading to Oakford Avenue - where the bag was later found. The pensioner's cash and bank cards were missing. Detective Constable Matthew Stevenson, of Avon and Somerset Police, described the attack as “despicable”. I’m sure these images will shock people who will be horrified that someone can target a vulnerable elderly woman in such a way,” he said. This is a despicable crime and we need the public’s help to identify the person responsible and bring them to justice. Anyone with any information is asked to call police on 101, quoting crime reference number 5219006773.